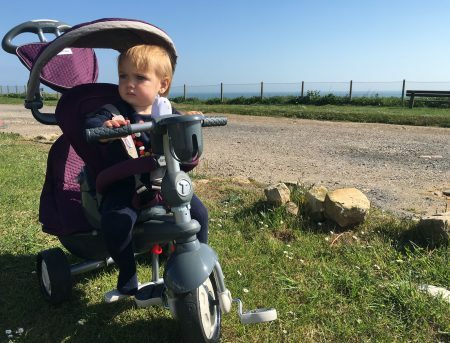 Sassie recently received her first ever tricycle; the 5-in-1 Recliner Infinity smarTrike, £130. She took to it immediately, having previously seen her big brother on one, but Sassie is also fiercely independent. 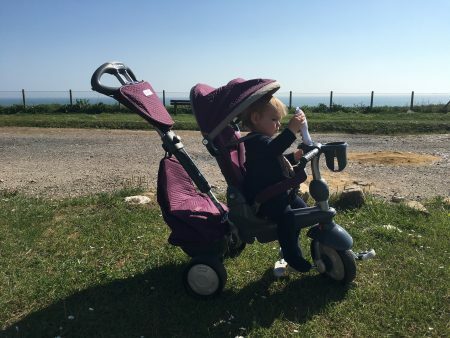 This particular smarTrike is perfect for mirroring the stages your baby goes grows through and encouraging their sense of adventure and awareness of the world around them. Ooh, and it has a phone. I don’t know about your kids, but my kids go bonkers for toy phones, it is scary how much they know isn’t it. SmarTrike’s 5 in 1 Recliner Infinity is designed for children aged from 10 months to 3 years. In its earliest guise, you push it along like a stroller and thanks to the smart patented Touch Steering technology, there is no shopping trolly syndrome. When they are able to ride themselves, the navigator button on the mudguard lets one switch from parent Touch Steering to child ride-control. 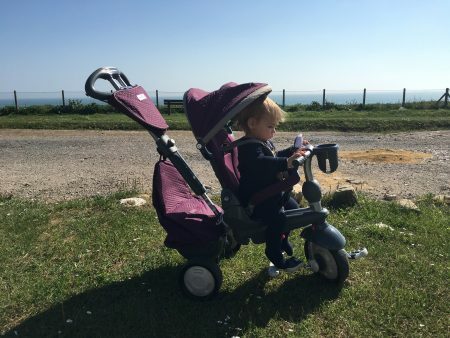 Don’t worry about sponging it down after muddy trips out either, the padded seat cover and the extendable canopy, the parent bag and the large, multi- purpose storage bag are all removable and washable, thank goodness. I love taking the tricycle out with us instead of our stroller as the storage bags carry all our snacks and essentials as well as toys to keep both kids happy! Sassie also feels more in control and independent in it = happy girl = happy parents. Stage 1: Sleep mode – The high back seat reclines, baby rests in comfort and security. Stage 2: At 10 months baby can safely use the foot rest and sit comfortably in the padded seat. Stage 3: At 18 months, now a toddler, they can sit upright independently and you can remove the safety bar. Parents continue to push and control the trike while the toddler enjoys the ride while developing confidence, balance and motor skills. Stage 4: At 24 months it becomes a training trike where kids learn to pedal. Stage 5: At 30 months you can remove the parent handle, close the safety clutch and it becomes an independent trike that kids pedal by themselves. That’s a lot of bang for your buck. We don’t just use the trike outside, Sassie loves to play with it indoors too. She often sits in the seat and plays with the phone (this just requires 2 x AA batteries). Sassie can’t talk much yet but she is very expressive and her contented look as she sits in the trike and while we travel about, tells me that she feels comfortable and free in it, as opposed to the evil stroller that straps her in. Personally, I love seeing her keen interest of the trike itself and what she notices in the world around her from it. I’m certain this helps support that sense of wonder and adventure. It’s like Sass is on cruise control as she glides through the adventure that is life. I wonder if they have one for adults? You can buy yours at Smyths Toys Superstores or Early Learning Centre. *We kindly received a PR sample but all words and opinions are my own. No payment has been received, I chose to include this on my blog as I feel it is relevant to my readers. A blog, a video channel, a shop page and styling services for parents, fashion lovers and coffee snobs. My newsletter offers you a regular round up of useful tips, inspiring ideas and updates direct to your inbox.